There are multiple benefits to having a planted freshwater aquarium. Plants increase the enjoyment and creativity of the hobbyist; they provide a superb habitat for many types of fish and other inhabitants, and they help provide stability to the aquarium. But in order to reap these benefits, you must keep and maintain healthy plants. A planted aquarium has a few unique considerations, beyond what is generally discussed for setting up a regular aquarium. These are not changes to what is normally required to maintain a fish tank, but it is essential that you understand the requirements of the plants you wish to keep. In order to keep and maintain healthy plants you will want to learn about the needs of each type of plant you are adding to your aquarium. Then you can provide your plants with the correct lighting, understand their heating needs, and choose the best type of filtration. Aquarium plants make a beautiful well balanced fresh water fish tank, as well as a natural home for happy freshwater fish! Quite simply, aquarium plants will make your tank healthier, more stable, and more beautiful. The benefits to aquarium stability and balance are numerous. Water plants produce oxygen through a process called photosynthesis, they absorb carbon dioxide, and they breakdown waste materials. Adding plants to your aquarium is one of the best things you can do for a stable fish tank. Increase your enjoyment! A planted aquarium means better displayed fish! Artificial lighting in aquariums is essential in growing and maintaining healthy plants. Light is needed for photosynthesis, and therefore it should be supplied for about 10 to 14 hours a day. Connecting the lights to timer switches can help in controlling this. 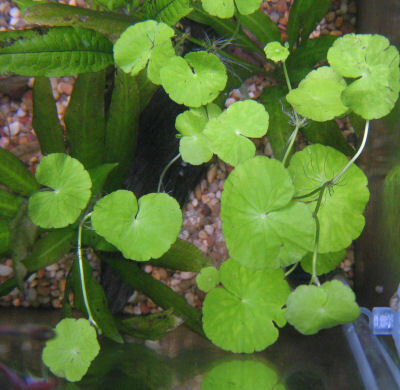 Most aquarium plants need plenty of light, however some species can do well with less lighting. As a general rule, plants with light green or red leaves need brighter lights than those with dark green leaves. There are several different types of lighting available for aquariums. Usually, fluorescent lighting is better for smaller aquariums and is cheaper than other types of lighting. Fluorescent lighting for aquariums usually produce a reddish yellow or reddish purple color. They are very efficient and cheap. About 2 watts of lighting should be supplied for every 4 liters of water. Fluorescent tubes should be changed every 6 months to a year because they become less effective over time. Mercury vapor lamps and halogen lamps both provide high intensity lighting and are suitable for larger, deeper aquariums (about 24 inches deep). They are generally placed above the aquarium (about 12 inches). Halogen lamps are more expensive than mercury vapor lamps, but they provide the best lighting for most plants. Plants generally thrive best between temperatures of 73 to 81 degrees Fahrenheit, but different plants have slightly different heating needs. Keeping the temperature fairly constant is important in planted aquariums because plants often cannot tolerate sudden changes in temperature. Using a thermostat is a good idea to help keep the temperature at a constant level. Heaters should provide about 1 watt per liter of water in unheated rooms and 0.5 watts per liter in normally heated rooms. Different types of heaters include automatic heaters that attach on the inside of the aquarium, thermofilters, bottom heaters, or simple heating pads that can be placed under the aquarium. In nature the substrate is usually warmer than the water, and the use of heating cables can simulate this in the planted aquarium. If you are using a heating cable, you will want a layer of sand that is about 1" - 1 1/2" deep to cover the cable. Filtration is a must in order to keep your planted aquarium clean and healthy. Plants are a big help in the process of filtering, and can convert ammonium as well as remove some metals, however other types of filtration are generally needed also. Filtration can be put into three main categories: mechanical, biological, and chemical. Mechanical filtration is often as simple as changing a portion of the water regularly in order to remove large debris and keep the aquarium looking nice. However, having an actual filter is recommended. Biological filtration is a more subtle extremely important type of filtration. In this type microorganisms are present in the filter which convert harmful substances into less toxic substances. This is especially important for fish because it reduces toxic ammonia and ammonium into less toxic nitrites, nitrates, and sometimes elemental nitrogen. Plants also act as a biological filter to some extent, especially in the reduction of ammonium. Chemical filtration uses a process called adsorption to remove many chemicals, such as heavy metals, from the water. Adsorption is the process where the chemical actually bonds to the surface of the media used to remove it from the water. Chemical filtration is not as practical as mechanical and biological simply because it is not selective in what it removes. It will remove both harmful and beneficial substances, which is not ideal for an aquarium. Therefore, using this type of filtration as a long-term solution is not a good idea. The basic process of filtration is to pump water through a canister type, or a hang-on the back type of filter that contains whatever filter media is needed - mechanical, biological, chemical, or a combination of the three. Filters can be either external or internal. Biological filters usually need a fairly fast flow rate so that the bacteria are provided with oxygen, however in planted aquariums, it is a good idea to have a slower flow rate so that it reduces the surface movement and so that it keeps the oxygen levels lower. In this case anaerobic bacteria (bacteria that live without oxygen) also need to survive to perform basically the same functions as aerobic bacteria. Undergravel filters are primarily a biological filter and are less desirable for a planted aquarium. Besides surface movement they cause a lot of water movement around the roots; thus cooling the roots, oxygenating the gravel, and removing the nutrients. Usually, if filters are kept clean and maintained well, an equilibrium can exist so that an environment is made where both aerobic and anaerobic bacteria can survive at a given flow rate.